"Laki would not want us to lose hope." We first met Laki Kal in 1999; after finding a link to his site in the GayPage Awards Hall of Fame. And if at first we were attracted by his beautiful aspect, then we were conquered by his personality, as soon as we started to exchange e-mails with him! I LOVE YOU, AND TELL YOUR FRIENDS THAT THERE IS ONE MAN IN THE WORLD WHO REALLY LOVES YOU. If you belive in love, please write to me, and write to other people with the same message. Lets all hug the planet with this message to people: a message of love, peace and friendship. I LOVE YOU AND I WILL LOVE YOU ALL MY LIFE. thank you for letter and very nice address. Sorry because my bad english. I like your website. You make perfect work. But more than that, your page have soul. I like this soul. I dont like to talk about my work with children who lose parents in war, because I work it with my heart. I need to do it. I grow up without parents, but I finished school, and study literature. I know what that children feel and need. I love them very much. I was hurt during NATO bombing, but I'm recovered now. I cant work too much on my page, because it is too much things to work with children. I dont ask anything from anybody. Only friendship, tolerance and love. Your letter is great support for me - I mean inner support, what mean to me much more that any material support. Maybe I am naive, or I dont know... But that's my inner nature, I can't be different, and I dont wish it. Thank you for very-very-very nice graphic. I'm learning now from your site. I need only to tell you true. everything what you give to children is nothing, what you recive when you see that children like you and see children smile. go to visit some institution for children without parents. You dont need to give them anything. Just be honest and be friend (not parent) with them. And when they see that you are honest, they will be very open to you. Than, when you see smile on their faces, you will know what about I wish to wrote to you. I'm very happy because you wrote to me. I was thinking that I wrote to you something wrong and that you are mad on me. I decided to make new site, where I will present children from Childrens Willage near Novi Sad (they loose parents in war). Maybe on this way people will see how good angels are this children, and maybe they can find family who will support them. I go on your page many times. Maybe for few week i will go for a while in Italy. Bella Italia :) I like Italy very much. Please advise me about this new site for children. Yes, Laki was really a beautiful young man with an even more beautiful soul! He was born in Tchechoslovakia in March 1979, and didn't know his parents. He only knew that he had a brother that he had not yet met. He devoted all his free time and money to assist and help the orphans of the Yugoslavian war, of any etnicity and religion. He also suffered injuries at some point during the war in Yugoslavia, while helping the little orphans. Laki recently met his brother, whom he had never known before. I believe his brother lives in the Czech Republic and through some investigation by a friend of Laki's, they were able to meet each other just a few months ago. Their appearance was very similar. 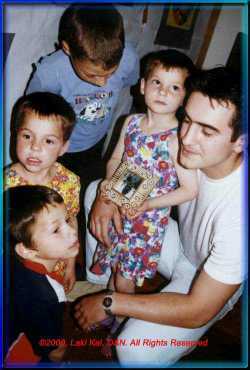 He went into the hospital some time before May 3, 2001. (The last e-mail one of his friends received from Laki was April 29). Some time in the early morning of May 4, around 3 a.m., he suffered a heart attack and passed away, leaving us. When we received the news, we were really devastated, unbelieving that he could be no more on earth with us! In him we miss a dear and precious friend. We will never forget you, Laki! In the following pages we dedicate to him a little gallery of his beautiful pictures.